Send the perfect gift to the most demanding taste. 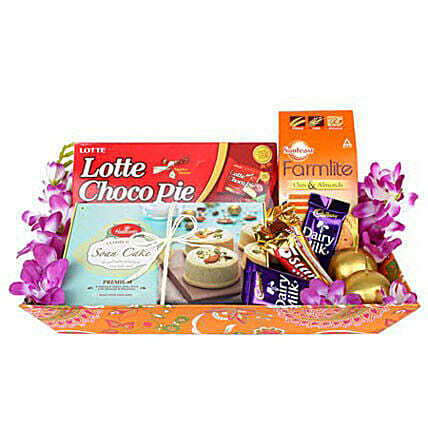 This unique fluorescent tray is outflowing with 250 grams of soan cake, 160 grams of choco pie, 12 grams each of two cadbury dairy milk, 22 grams each of cadbury five star, 150 grams of farmlite oats & almonds cookies and two golden ball candles. Please note : The color and design of hand crafted products like diyas/candles/idols may vary depending upon the availability.